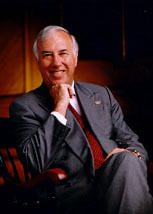 Current Clark School professor of mechanical engineering and former UMD president C.D. (Dan) Mote, Jr., is the sole nominee for the presidency of the National Academy of Engineering beginning July 2013 for a six-year term. Voting will take place in March 2013. "I am thrilled that Dan has accepted the nomination for the NAE presidency," said NAE council chair Charles O. Holliday Jr., retired chairman of the board and CEO of DuPont. "His passion for engineering excellence and his experience advancing the profession make him the ideal person to build upon the leadership of Chuck Vest." From 1998 to 2010, Mote served as UMD president and Glenn L. Martin Institute Professor of Engineering. Under his leadership, UMD research funding increased by more than 150 percent and the university greatly expanded partnerships with corporate and federal laboratories. Mote also negotiated establishment of the University of Maryland-China Research Park, connecting Maryland and Chinese companies for joint ventures. Stressing the importance of closing the achievement gap, Mote helped UMD achieve the fourth highest graduation rate for underrepresented minorities in 2007 among public research universities. He has testified before Congress and been featured in the news media on issues ranging from education funding models to visa barriers for international students to deemed export control issues. Mote was elected to the NAE in 1988 "for analysis of the mechanics of complex dynamic systems, providing results of great practical importance in vibrations and biomechanics," and is the current NAE treasurer and a member of the Research Council's Governing Board Executive Committee. In addition, he co-chairs the Government-University-Industry Research Roundtable and Committee on Science, Technology, Engineering, and Mathematics Workforce Needs for the U.S. Department of Defense and the U.S. Defense Industrial Base. His past Research Council service includes membership on the Committee on Science, Engineering, and Public Policy and chairmanship of the Committee on Global Science and Technology Strategies and Their Effect on U.S. National Security. Mote received his B.S., M.S., and Ph.D. in mechanical engineering from the University of California, Berkeley, where he served on the faculty for 31 years and held positions as chair of the department of mechanical engineering, president of the UC Berkeley Foundation and vice chancellor. He has received three honorary doctorates and the Berkeley Citation, an award from the university similar to an honorary doctorate. For more information, see the NAE press release online and the UMD press release online.